This year’s Food Bloggers Indaba was an amazing event! I would like to start by congratulating Colleen for the amazing effort she put into making sure we had a fantastic day. 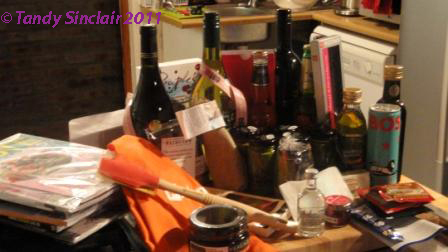 Thanks must also go to all the sponsors – we hefted our goody bags at the end of the day and this photograph does not do justice to the bounty we unpacked at home. The morning was a bit rushed, as we were late to do the registration and Jenny Morris took ill, but as soon as everyone had their stickers and Jeanne had been roped into being the MC, we got started. choose your platform (i.e.Wordpress) with where you want to be in the future and what your needs are. I have chosen wordpress as it works best for me in terms of saving drafts and having my own URL. It may not work best for you but if you have not yet started blogging, research the various platforms with a long term goal in mind. make sure that if you don’t know how to use coding you do not use a platform that needs it. HTML coding is not a basic necessity but, if you ever need to find something about coding, you can refer to google for help. I like to use coding, and wordpress gives me the option of using html. decide whether you want to have advertisers on your blog or not. Some platforms do not allow this. I don’t want to have advertisers as I want to keep my blog as objective as possible. think about your name – something short, and easy to remember works better than something long and complicated. I had already chosen Lavender & Lime before last year’s Food Bloggers Conference when Jeanne told us this for the first time. I would never change my blog name, but I have used my own name as my URL and twitter handle. decide what your niche market is going to be. Decide what type of blog you are going to have, find a formula and stick to it. It took me a long time to have a formula but the one I have now really works for me. are you a cook who writes; or a writer who cooks? I am still a cook who writes so my blog posts are recipe heavy. where is your audience based – if in America then you need to write your recipes in terms they understand. I have a world wide audience, but as I have chosen to emphasize regional and seasonal produce, I am sticking to South African measurements. always choose quality over content. Good photographs and good, well written blog posts. Do not blog for the sake of movement on your blog. You need to entice people to keep on coming back to your blog. use your personal voice. I write as I speak! write every day even if it is one line, writing needs to become a habit. I have kept a journal for years and writing is a discipline. keep a draft folder. I use the wordpress draft folder but you can use your word editing program, use headings that will prompt the memory. use your downtime to think about your post. I have a lot of downtime, in the car and at gym and I am always thinking about my posts. Often the words don’t translate very well from memory to computer but they are always there. try different approaches. if you get stuck, try a new way of looking at the post. if you get something for nothing i.e. freebies, disclose the fact, and do so visibly I personally feel this should go at the beginning of the post, rather than at the end, so that your readers know from the outset, what you got or experienced did not cost you a cent. do not use tech speak i.e gr8, c u etc. use capitals for I, place names etc. most importantly, blog for the love of it! Wow! Brilliant and now I need to bookmark this page so I have all of these points in front of me! Thanks for this! Was fabulous meeting you! I fell in love with the SA bloggers! What a great group of people and I felt so welcome! Can’t wait till next year! Thanks for sharing this with us Tandy – i look forward to the day that Letterdash has a draft storing facility OR until Food24 moves platform!!!!! Glad you took down notes 🙂 I missed out on this class, so it’s nice to hear what the others did in such detail. Tandy, thanks for sharing this with us poor souls who were unable to attend, really appreciate it. my pleasure 🙂 maybe next year you will be there! Thanks for the wonderful notes. I have learnt so much at both of the conferences. Networking in an environment like this we all learn so much. Wow, you did listen very attentively, or did you get your hands on the notes. Thanks Thands for all your help and input! I wrote copious notes so that I would not miss a thing! Im very grateful for people who listen attentively when others are speaking and who take their own notes. Thanks Tandy! the listening bit was the key to my enjoyment 🙂 and of course helping you and meeting awesome bloggers! You’ve covered her talk very nicely, Tandy. In hindsight I didn’t take enough notes, so thanks for this! Look forward to reading more about your experiences at the Indaba. I can’t believe how the past week has flown. Fabulous post. You listen well hehe. I hope to finally get my first indaba post out today. Its been a hectic week following Indaba.